With (most of) the full gallon of strawberries we picked earlier in the week still in the fridge, Parker and I headed out to pick up our very first CSA box of the season last Thursday. Have I shared that I'm twelve kinds of excited about belonging to Community Supported Agriculture this summer?? Local produce? Every week? Yes, please! Imagine my chuckle when I spotted strawberries in our basket. But wait. We also signed up for a "Fruit Lovers" add-on to the regular box. 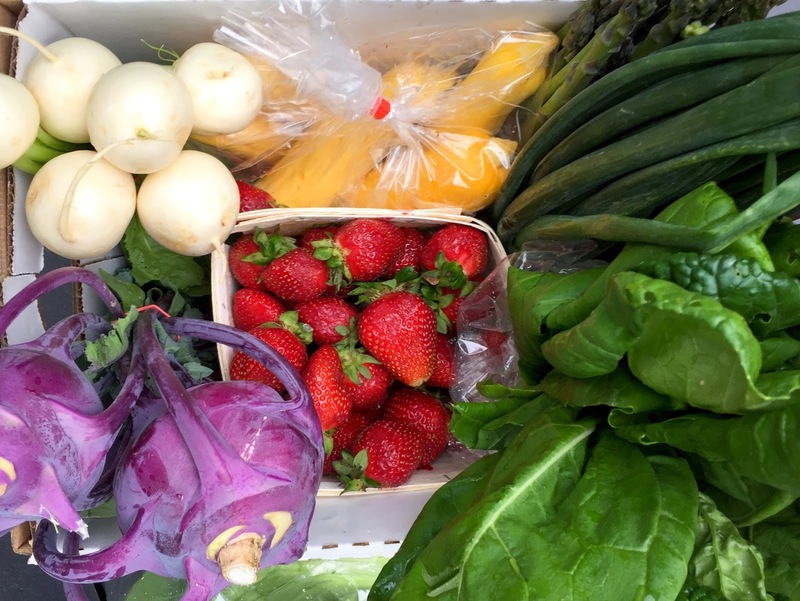 So every week in addition to the mostly veggie half bushel, we'll also get two pounds of fruit. One guess what this week's fruit was. Yep, we have strawberries coming out of our ears. As husby pointed out, that's not a bad thing. 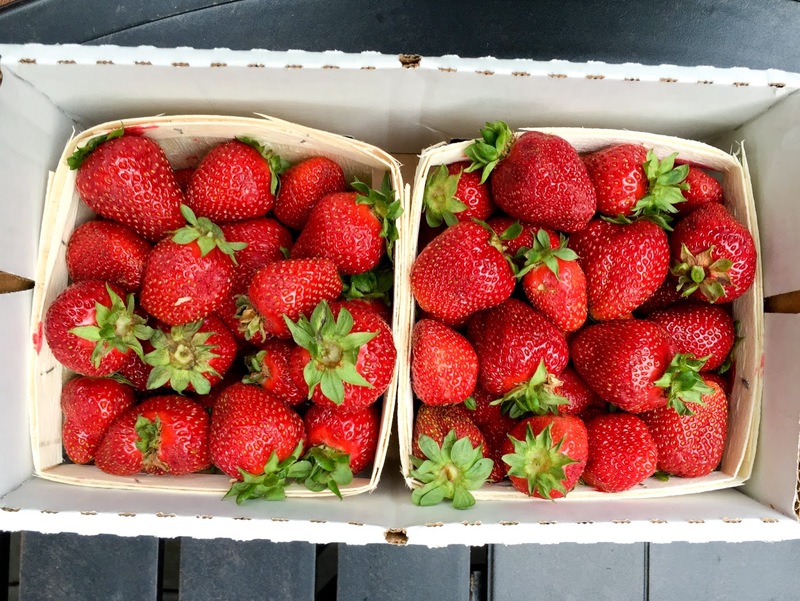 In fact, lots of those strawberries have been gobbled up just by themselves. But since we do have so many, I'm making an effort to incorporate them into our meals and treats. 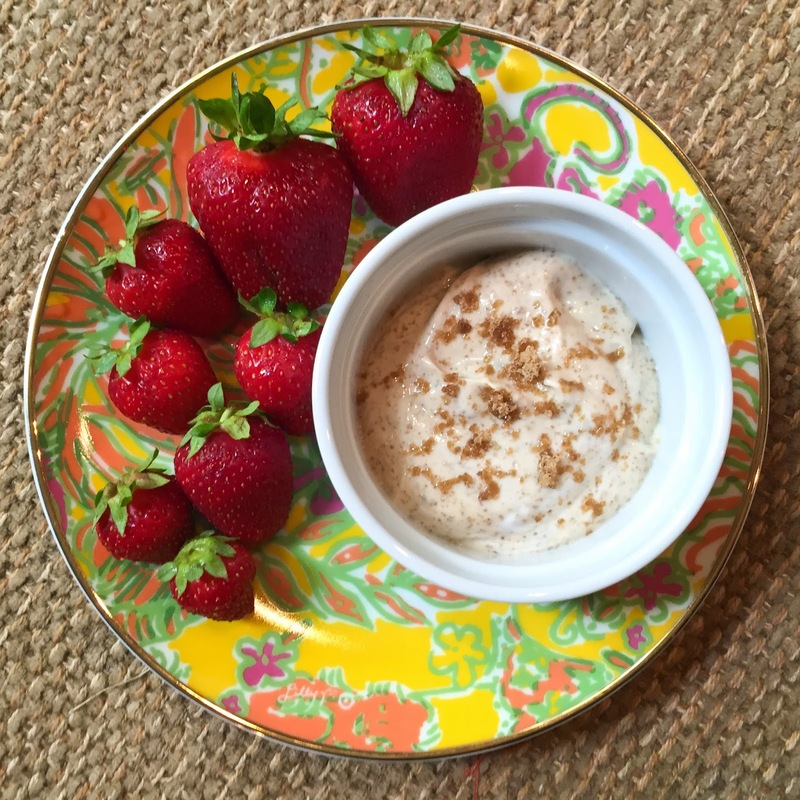 First, Strawberries + Brown Sugar Dip. Max initially made this for me when we were dating. The dip is just a mix of brown sugar and sour cream (sounds odd, but it's fabulous!). Since we didn't have sour cream on hand, I made this dip with plain greek yogurt and brown sugar. To make, just plop a dollop of yogurt in a bowl and stir in lots of brown sugar. Yum! Next, I added strawberries to my morning toast with cream cheese. A perfect breakfast. One of my very favorite salads is this super simple Strawberry Salad. 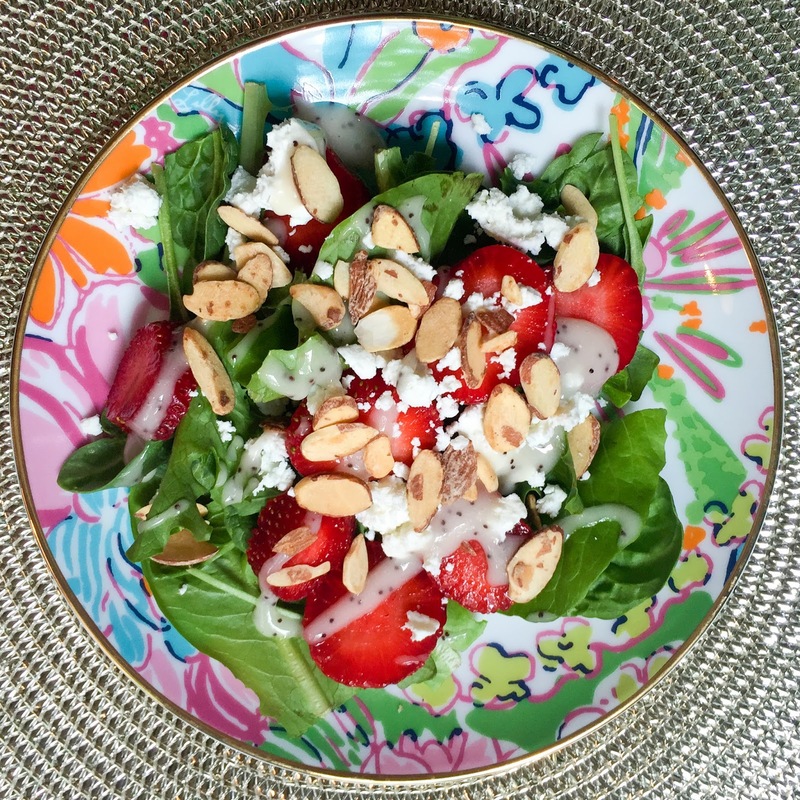 Start with mixed greens, and add strawberries and sugared almonds. Toss with any jarred Poppyseed Dressing and you have a gorgeous salad (I also added goat cheese to this one). Finally, knowing about our strawberry abundance, my sweet sister sent this recipe for Strawberry Sorbet. It only requires four ingredients. Four! 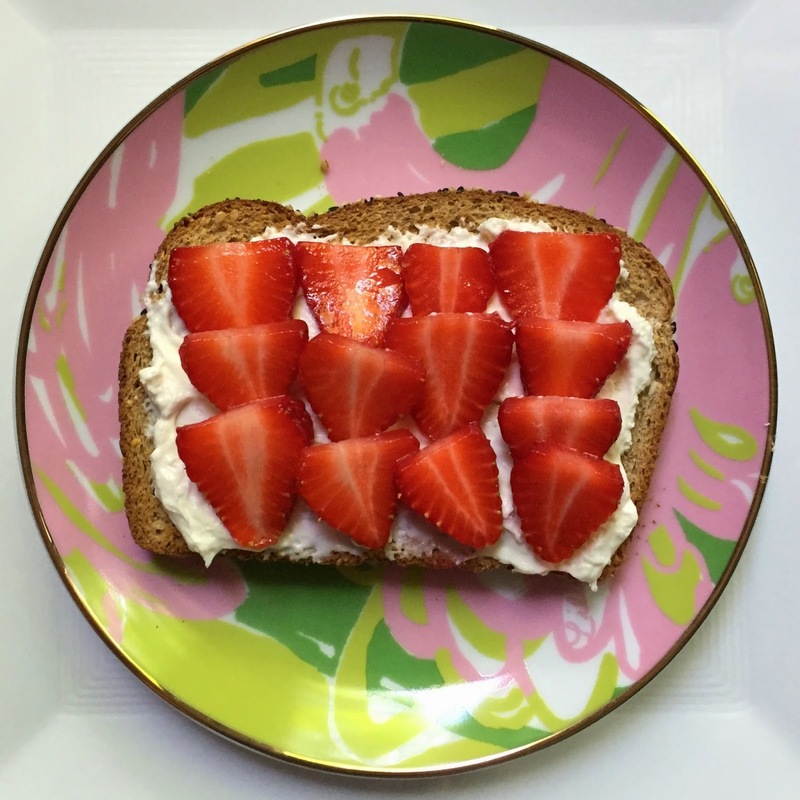 Strawberries, plain yogurt, honey, and lemon juice. And all you need to make it is a food processor. It seemed too good to be true. I was expecting a disaster, but look! Perfect, no? 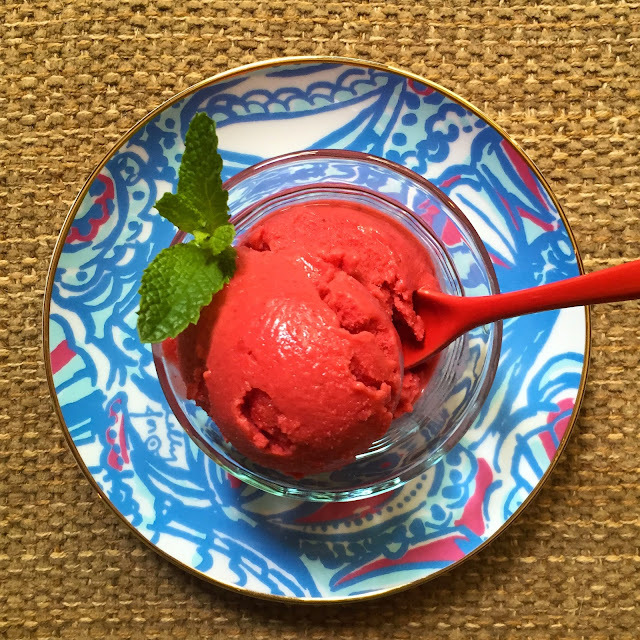 The sorbet was ridiculously simple to make, and I cannot believe how well it turned out. I even added a sprig of fresh mint from the garden. And you might have noticed I'm totally loving my Lilly for Target plates! They are the perfect size for small meals and snacks. What do you do when you have strawberries for days?? Omg all of this looks amazing! Love the plates and I'm totally making all of this!